Railway minister Suresh Prabhu today said the Indian Railway Catering and Tourism Corporation Limited (IRCTC) would promote the Darjeeling tourism circuit and its portal would be used to boost local handicraft throughout the country. Prabhu was addressing a programme where a "fund-in-trust" agreement was signed between the ministry of railways and Unesco for preparing the Comprehensive Conservation Management Plan (CCMP) for the Darjeeling Himalayan Railway. The railways is paying Unesco Rs 4.2 crore for preparing the plan. The agreement was signed by R.K. Verma, secretary, Railway Board, and Shigeru Aoyagi, the director of Unesco and its representative in India, Bhutan, the Maldives and Sri Lanka, at the Gorkha Rangamanch Bhavan here. 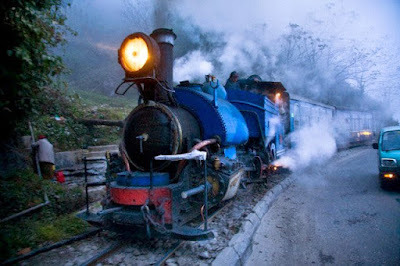 "The IRCTC will promote the Darjeeling tourism circuit. The IRCTC portal will also be used to promote handicrafts of local craftsmen and we will work closely with the GTA," said Prabhu. At the programme, the minister flagged off 14 projects implemented by the Eastern Railway, South Eastern Railway and Metro Railway. Prabhu directed railway officials to conduct a survey on constructing a rail link between Siliguri and Darjeeling through Mirik and look at the possibility of operating the now defunct Gulma station near Siliguri. The minister donated Rs 5 lakh to the Kanchenjungha Dance Academy that performed at the event. Prabhu, however, made a slip at the fag end of his speech. Referring to the Gorkhas, he said: "Wherever you are in the country, Mumbai, Delhi, the people who are always with us are the Gorkha people. I have come to pay my respects. Our relation with Nepal is very deep. I always say people of Nepal are not just our brothers but we are twins. The relations between India and Nepal are very deep and we will continue to work to improve it and also work for a railway connectivity to Nepal." The demand for Gorkhaland also stems from the fact that people of Darjeeling believe they are often perceived to be Nepali citizens and the statehood would help erase doubts about their nationality. Generally, , which is often confused with Nepal in mainstream India. The minister seemed to be unaware of the local people's sensibilities. Sometime after finishing the address, Prabhu again took the mike and said in his earlier speech, he had been trying to stress the need to improve rail connectivity with neighbouring countries like Myanmar, Nepal, Bhutan and Bangladesh and the Gorkhas of Darjeeling were Indians. "Earlier in my speech, I had said we were trying to improve rail connectivity with our neighbouring countries, apart from improving connectivity in the country.......I want to pay respect to my Gorkha brothers from here who are Indians and are providing protection to our country," said Prabhu. Morcha leaders did not want to comment on Prabhu's speech on record. A senior Morcha leader, who didn't wish to be named, however, said: "Confusion still prevails in the country. Surely, that portion of the minister's speech does bring back the issue of our identity and the general perception in the country." Prabhu said the Narendra Modi's government was looking at increasing investment in the railways which had been up from around 40,000 crore per annum to Rs 1.2lakh crore in the past three years..